Sculptured lamp for floor or table. 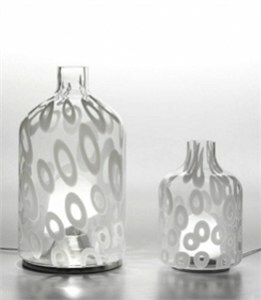 The blown glass diffuser accommodates an interior hollow glass bubble; a smaller negative space pocketed inside the larger diffuser. Available in the following versions: Clear crystal with white �murrine�, Metal structure with brushed nickel finish. LIGHT SOURCE max 1x60W G-16� watts, candelabra (provided).